Kids of deployed parents who enjoyed a strong human-animal bond had better coping mechanisms than children who did not have a pet. But that’s not the whole story: Why do we continue to embrace these domesticated animals like members of our family, even though they no longer fulfill our pragmatic needs? The new Tufts institute, launched earlier this year, is examining the importance of our relationships with other species. But instead of working in the traditional silos of fields such as veterinary medicine, human medicine and psychology, TIHAI draws on faculty, staff and students from myriad areas of expertise. For the study of military children, Megan Kiely Mueller, A08, G10, G13, a developmental psychologist and a research assistant professor at Cummings School, and Kristina Schmid Callina, a research assistant professor in Tufts’ Eliot-Pearson Department of Child Study and Human Development, surveyed nearly 600 kids from military and nonmilitary families about their interactions with animals in the household and their stress levels and coping strategies. The study, funded by Zoetis and Tisch College of Citizenship and Public Service at Tufts, was published in Applied Developmental Science in October 2014. Conducted in partnership with the Military Child Education Coalition, the study “found that animal ownership was linked to a host of positive outcomes” in all the kids, whether they had a parent deployed or not, says Mueller, co-associate director of TIHAI and a senior fellow at Tisch College. 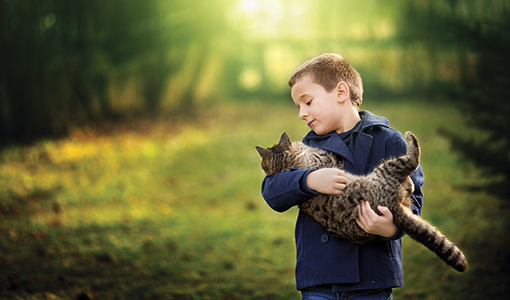 Children who had formed bonds with companion animals were more confident and had stronger relationships with their families and peers. Many said their pet keeps them company when a parent is deployed or serves as an oasis of stability when their family moves to a new home. Most significantly, the researchers found greater coping mechanisms among the kids with deployed parents who enjoyed a strong human-animal bond compared with those who didn’t. “Strong attachments to pets may foster a more proactive attitude about handling stressful problems and could serve as a bridge to developing and maintaining peer relationships during stressful circumstances,” says Mueller. “What’s so special about this study is that we are looking not just at the kids but at the parents and therapy animals, too,” says Linder. The psychological benefits of a 20-minute visit with a therapy dog for the children and their parents will be compared with those of families who did not receive therapy-dog visits. Physical effects, such as heart rate and blood pressure, also will be assessed in the children. Another hot area of investigation at Tufts is how animal-health challenges can attract more girls and other traditionally underrepresented groups to careers in science and technology. “We know that animals are a great way to engage kids and young adults in different activities,” including science, technology, engineering and math subjects, says Chris Rogers, a professor of mechanical engineering and co-director of Tufts’ Center for Engineering Education and Outreach. Rogers, a member of TIHAI’s board of advisors, has worked with Cummings School veterinarians to get middle school students involved in developing engineering solutions to problems in veterinary medicine, such as helping a paralyzed dachshund get around. Research conducted through the Tufts Institute for Human-Animal Interaction will help animals, too. Over six weeks, McKinney measured the cortisol levels of six horses during their rest days, regular workouts and therapeutic-riding sessions. Designed to determine whether the horses were at risk for health problems caused by chronic stress, the study indicated that the horses “seem to be doing just fine,” says McKinney. The researchers hope to follow up with a larger study of horse welfare. A second project at Touchstone, funded by the Horses and Humans in Research Foundation, is examining how employing horses as part of psychotherapy can reduce symptoms of post-traumatic stress disorder (PTSD) in children. Therapists instruct the kids to interact with horses to demonstrate how the children’s body language and other physical cues influence the animals’ behavior. “One of the symptoms of PTSD is being either hyperaroused or underaroused,” says Mueller, and the horses react to that—avoiding the jittery kids and ignoring those who are emotionally detached. In order to interact positively with their therapy horses, the children must learn to better regulate their own fight-or-flight response—by taking deep breaths and employing other techniques to lower their heart rate and relax their muscles. Insurance companies rarely cover equine-assisted therapy and typically only when a horse is employed as platform for physical exercise that improves stability or range of motion. As a result equine-assisted psychotherapy is often out of the financial reach of many, Mueller says.